Do YOU want a better life? More control? Wealth... Love... Success? Do you find yourself constantly frustrated that, no matter how hard you try, you cannot escape your bad luck? In which case, NEW MAGICK TAROCCULT POWER is for YOU! For the first time, ANYWHERE, Vernon finally spills the beans on his own, PERSONAL means of success in life. 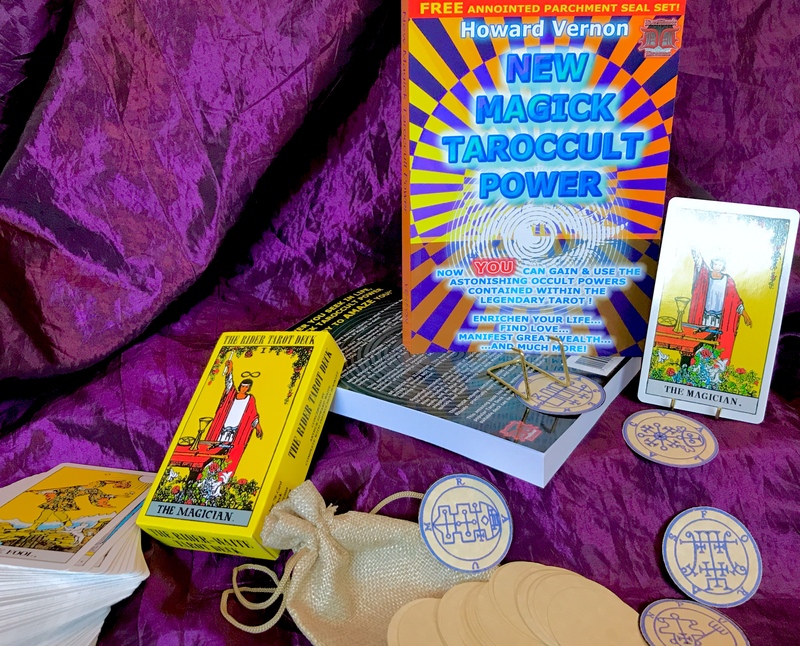 NEW MAGICK TAROCCULT POWER is unlike anything you have ever seen before! A complete system of POWERFUL LIGHT AND DARK MAGICK, using the hidden gates of the Tarot. This astonishing NEW way of working is skilfully blended with a heady mix of Mystical Kabbalah, its opposite , the shadow-realms of the Qlippoth, and a number of POWERFUL GOETIC DEMONS, selected especially for this system! BE UNDER NO ILLUSION - This book carries STRONG BLACK MAGICKAL RITES; it should NOT be used by anyone of a nervous disposition, or who is lacking in conviction. Supplied complete with a full set of Magickally-anointed Parchment Seals, to enable you to create your very own, ultra-powerful DEMONIC SIGIL SET. Also included is a natural fibre draw-string pouch, to store your completed seals, and an Altar Stand to display your chosen Tarot Card - EVERYTHING is supplied, to get you working your NEW MAGICK TAROCCULT POWER quickly and easily! This HUGE volume contains DOZENS and DOZENS of powerful Taroccult Rituals - practically every want and need is covered within these pages! This amazing book has been written to work in conjunction with the most popular Tarot Deck in the world - The Rider-Waite Tarot, though any suitable deck can be used.